of work at the Free University I should have valued, more. §1. At the urging of the collaborators of the research project “Archaic Texts from Uruk”, the Berlin Senate purchased in 1988 a large portion of the former Erlenmeyer collection, consisting primarily of the then largest privately held group of proto-cuneiform tablets, but also including a number of attractive Ur III tablets. Six documents of that group of texts have been dealt with in two earlier publications. The text treated here was sold during the 1988 Christie’s of London auction as lot no. 92 at a price of £ 14,000 (see figure 1). 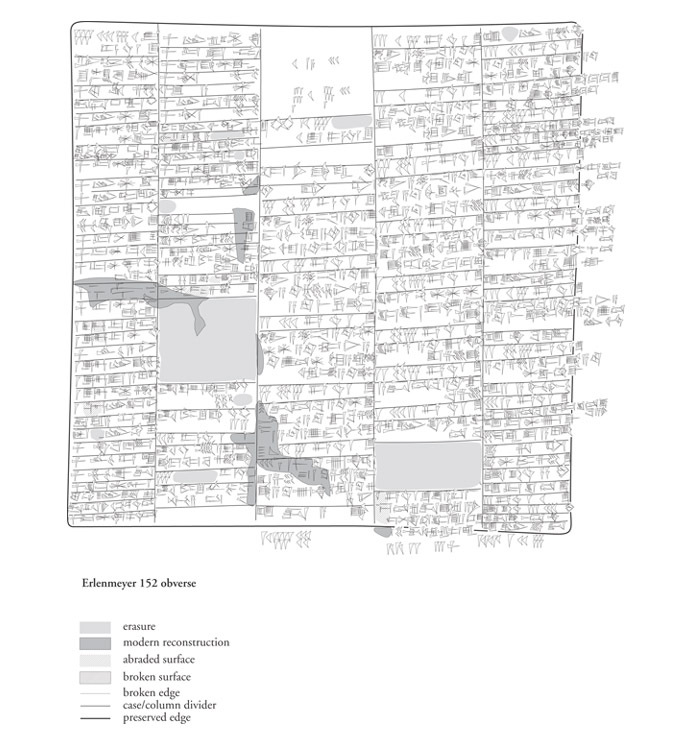 This large Umma account of guruš workmen belongs to a select published group of at most two dozen large texts from the Ur III period, with a particular affinity to MVN 15, 94, MVN 21, 199, and TCL 5, 5674. §2. The text Erlenmeyer 152 dates from the second regnal year of Šu-Sin (ca. 2036 B.C. following the now less reliable middle chronology). It contains a year account of a 33-man workforce under a foreman named Lu-Šara. As with any planned economy, the production numbers posted in this account represent a mix of the artificial production norms that were attached to the workmen assigned the foreman by the agents of the household for which he worked, and the real production of the same workmen as confirmed in a large number of receipts. In both cases, the production was converted into “worker days” (guruš u4 1-še3) by multiplying the number of workmen by the number of days they either worked, or were expected to work to complete a set task. 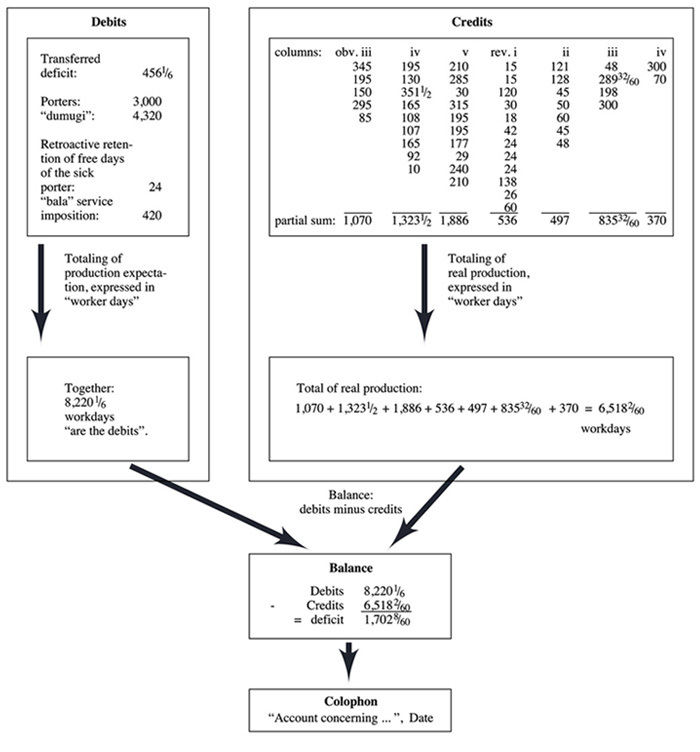 The document has the characteristic structure (figure 2) of yearly accounts of the Ur III period, consisting of sections conveniently designated “debits”, “credits”, and “balance”. 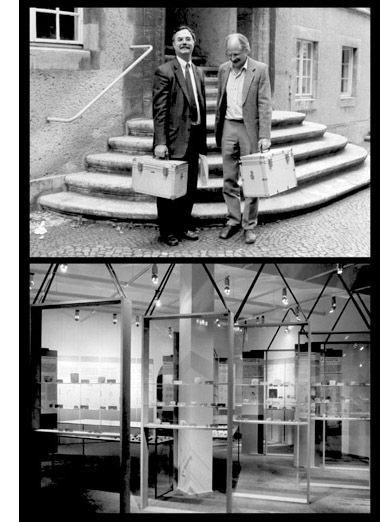 Figure 1: Hans Nissen and Peter Damerow arrive in Berlin with the Christie's tablets of the Erlenmeyer Collection (above); the exhibition Frühe Schrift in the Charlottenburg Palace, Berlin, in the summer of 1990 (below; photos courtesy of Margret Nissen). d) and all records of the work done by this crew over the twelve months of the completed year. The accountant must proceed to order these perhaps dozens of tablets, presumably in the same sequence as that found in the account Erlenmeyer 152, with those primary records and the previous account of a-c) strictly distinguished from those primary records of d), for the most part sealed receipts probably gathered by the foreman in the course of the year, that represent the real and documented production of his workmen. §4. 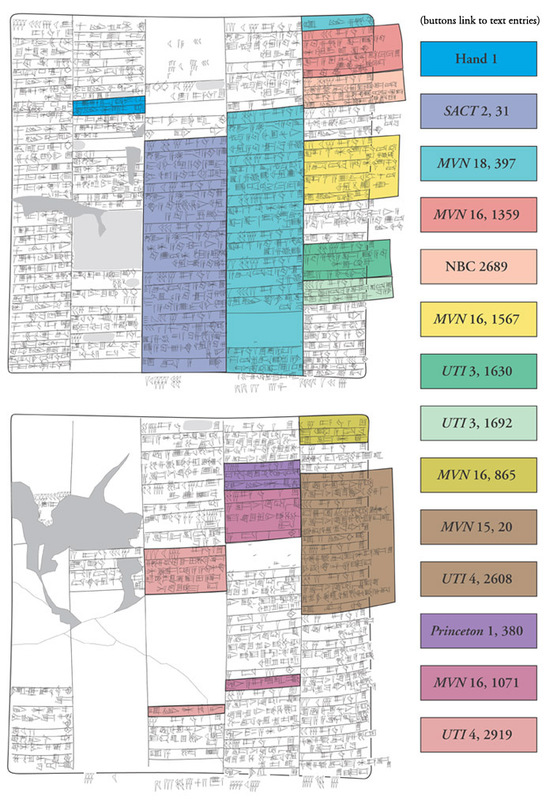 With the access to larger numbers of Ur III documents made possible by the continuing publication of administrative text collections and by the networked distribution of the text content within these publications, specialists have been able to identify more and more of the primary documents on which Babylonian scribes based their mid- and long-term accounts. In the present case, twelve such primary texts have been located in collections that range from Istanbul to Barcelona, from New Haven to Ft. Myers, representing the most substantial coverage of a large Umma account heretofore achieved. And yet if it were not for the fortuitous appearance of a receipt from a private collection in Florida (the text Hand 1, see below), this study would contain nothing entirely new. For this one text is to my knowledge the first known example of a receipt that documents the movement of real goods or services within the “debits” section of an Umma account. §5. All these records in hand, our scribe must have performed some preliminary calculations to judge the size of tablet he would need for this account, and he then proceeded to enter all the information before him, following a strict bookkeeping template that dictated the means by which data was standardized and “compressed” to form a meaningful yearly record. We expect to soon have the tools to fairly reconstruct the involved instruction that complex Ur III accounting presupposes. Certainly the concrete texts themselves are our primary sources for this reconstruction, but the growing numbers of exercise accounts, and of account duplicates, triplicates and so on, can be brought to bear on the question of how large running accounts were kept. 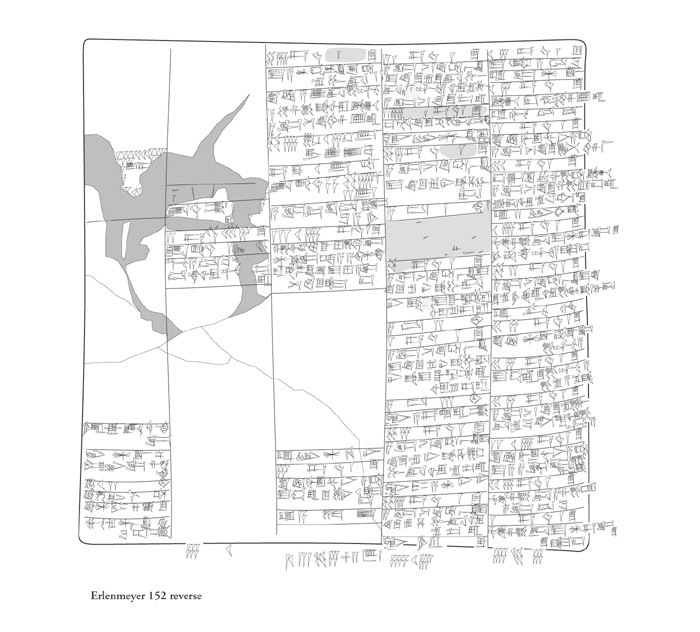 The most involved examples of such documents from the Ur III period seem to derive not from Umma, but rather from the agricultural bureaus of Girsu, of which numerous examples have been offered in the work of K. Maekawa. 5) kišib na-ra-am-i3-li3 sealed (tablets of) Naram-ilī. 2) mu 13-[kam] [it is (a period) of] 13 years. §8. The first section of the account, the debits (obv. i 1 to iii 4, described by the Sumerian term sag-nig2-gur11-ak-am, “it is the head of the goods”), consists of three subsections. In the first place, the scribe posted a record of arrears accruing to the foreman Lu-Šara from his previous running account. The notation obv. i 1 corresponding to 456 1/6 workdays is not substantial relative to deficits posted in the accounts of comparably sized troops of workmen, and it will in the course of this account balloon to a total of over 1700 workdays recorded in rev. v 3. It is difficult to overstate the seriousness of these deficit workdays for the foremen involved, since a capricious central administration at the level of the province governors, or the crown in Ur, views them as effective loan debts that can be called in at will. In practice, their threatening nature is most obvious when the involved foremen go missing, either as a result of flight from service, or of death. In such cases, the households of the individuals are claimed by the state, including, dependent on the level of arrears, property, moveable goods, chattel slaves and family members. §10. The three workmen listed in obv. ii 10-14 of this subsection were received by the foreman Lu-Šara from two named individuals. The first of these two entries was copied from a primary text now in the private collection of C. Hand in Ft. Myers, Florida (see figure 3). Although the name of the foreman Lu-dingira, from whose crew the dumugi workman was transferred to Lu-Šara, is not preserved, there can be little doubt that this text was the source for the Erlenmeyer entry. The name and work-norm qualification of the laborer is the same; it is dated to the precise moment (beginning of the first month of Šu-Sin 2) of the beginning of this man's work under Lu-Šara; the laborer was booked as having been received from another ugula, consistent with the format and seal of Lu-Šara on Hand 1. Indeed, this latter consistency in format and sealing was a central search criteria in identifying all other primary documents used by the scribe of Erlenmeyer 152, but, as sources for the credits section of the account, flipped to name another official as receiving and therefore also sealing agent, and Lu-Šara as agent of delivery (usually noted as “Foreman: Lu-Šara”, so that Hand 1 rev. 1 might be reconstructed with [ugula] ˹lu2˺-[dingir]-˹ra˺). 3) lu2-dšara2 i3-˹dab5˺ Lu-Šara seized (administratively). 2) mu ˹ma2 d˺en-ki ba-ab-du8 Year: “The boat of Enki was caulked”. §11. The third subsection of debits contains two numerical entries. The second of these, 420 workdays described as “the production of 'dumugi apprentices' in bala service,” seems to represent a sort of tax assessed against the foreman, since no compensatory allowance of laborers is evident in the text. The first entry of 24 workdays is qualified as a2 u4 du8-a ug3-ga6 sag-ba zi-ga, “the production of free days of the porter already booked out of the debits”. 24 days correspond to 1/10 of the work period of 8 months recorded in the debits section of the account as sick-leave time of the porter Ea-lubi (obv. i 21 and obv. v 27-31). The period in which this worker was missing due to illness, that is, the final eight months of the fiscal year covered by this account, were qualified as work performance and this labor time was “received” by the official Ur-E’e. This accounting procedure presumes a certain social quality within the organization of the household that ultimately acted as slave master to such laborers, for their rations were distributed entirely independent of their specific production. Nonetheless the Ur III social state remained punctilious; those 24 days which had, for accounting technical purposes, been deducted from the debits in rev. iv 2-3, were here retrieved for the state, in exact parallel to other cases in Ur III accounts of the retrieval of free time accorded, again for technical reasons, sick or dead workers. §13. The following “credits” section of the account (obv. iii 5 to rev. v 2, Sumerian ša3-bi-ta——zi-ga-am3, “therefrom (viz., from the debits) deducted”) demonstrates that the crew under Lu-Šara performed above all agricultural jobs, including, however, the transportation of products and the maintenance of the irrigation system. We must again imagine that the Sumerian bookkeeper drawing up this account had before him all sealed receipts gathered in the course of the year by the foreman Lu-Šara, and that these primary documents were ordered roughly according to the type of work they confirmed. Thus the first documents entered in the account dealt with what was likely the primary assignment of this work crew, namely, the field tasks of harvesting grain and maintaining the system of canals upon which Babylonian agriculture depended, including the labor-intensive dredging of established, and the excavation of new canals. A second set of tasks consisted of the assistance of his crews in the transportation of various commodities by barge along the canals of lower Mesopotamia: reeds, leather bags, processed and unprocessed cereals, fish, dairy products and even oxen. rev. ii 3-5 Princeton 1, 380? §15. These primary documents follow a strictly standardized format: so-and-so many work days; description of the task completed; foreman of the crew involved; notice of the seal of the receiving agent (kišib PN); the physical impression of the cylinder seal; date formula. Both of the pieces of information corresponding to MVN 16, 1567, rev. 2 and 4, are supplied in the colophon of the account Erlenmeyer 152: the year formula, and the general qualification rev. v 5-6: nig2-ka9-ak a2 erin2-na-ka / lu2-dšara2 ugula dumu lugal-inim-gi-na, “account of the production of the erin workers. Lu-Šara is the foreman, son of Lugal-inim-gina”. It is safe to assume that the second sealed tablet is a copy of this one, exchanging 42 for 2.15 in the first line. §18. The accountant responsible for Erlenmeyer 152 employed a standard method of calculation of the credits section of the text, consisting as it did of a large list of numerical notations (see the transliteration, and figure 2 above). Partial sums inscribed at the bottom of each column were evident tools to simplify the final summations, and to serve as a second control of the accuracy of entries. Despite the difficulties introduced into the calculation flow by the various modern “improvements” in the damaged surface of the tablet (see the notes below in the transliteration), it has been possible to reconstruct the entire account with little likelihood of error. This reconstruction demonstrates that the scribe calculated with untiring precision, and raises anew the question of the calculation tools he must have employed to achieve this result. We unfortunately cannot state with confidence what these tools were, whether for instance the scribes had a set of counting tables or abacuses, and whether preliminary tablets were first written and then copied onto a master text. It would seem unlikely given the high number of erasures evident in this text that it should have represented the final of two or more drafts. Moreover, the traces of numerical notations in obv. iii 1, giving the impression of an ancient “scratch pad”, are suggestive of the use of ad hoc calculation aids, including these but doubtless other simple techniques. §19. The last section of Erlenmeyer 152 (rev. v 3-10) includes global qualifications of the account (i.e., that it involved the work crew of Lu-Šara and covered the twelve months of Šu-Sin 2) and the balance of the total of the debits section minus the total of the credits section. This balance is negative (debit greater than credit) and therefore qualified with the technical term la2-ia3, “deficit” (not preserved, but certain in rev. v 3). This means that insofar as we have a full accounting of the work performed by the foreman's crew for the year, the total of their real production fell well below the production expected in the debits section of the account, so that the deficit compared to that of the preceding year increased nearly four-fold. We can hope that, with renewed Iraqi excavations of Umma/Djokha and its surroundings, more accounts will surface that inform us of the ultimate fate of this foreman. 2) si-i3-tum mu dšu-dsuen lugal deficit of year “Šu-Sin is king” (Šu-Sin 1). 4) gab2-us2 gišapin-du10 herding apprentice of Apin-du. 5) 1/2 lu2-dšara2 1/2 (workman): Lu-Šara. 7) ša3-gu4 ur-gišgigir lugal-ku3-ga-ni i3-dab5 oxen driver of Ur-gigir, Lugal-kugani took responsibility for him. 8) 1/2 ur-dšul-pa-e3 1/2(workman): Ur-Šulpa'e. 11) gab2-ra gišapin-du10 mu ku3-ga-ni-še3 gabra(herder) of Apin-du, instead of Kugani. 12) 1/2 ur-pa4-u2-e 1/2 (workman): Ur-Papu'e. 13) 1/2 ur-dma-mi 1/2 (workman): Ur-Mami. 14) 1/2 ur-dšul-pa-e3 simug 1/2 (workman): Ur-Šulpa'e, smith. 16) 1/2 ur-d˹bil4˺-ga-mes 1/2 (workman): Ur-Gilgameš. 18) 1 ug3 ur-dutu 1 (workman) porter: Ur-Utu. 19) 1/2 šeš-a-ni 1/2 (workman): Šeš-ani. 20) 1 ug3 lu2-ga-mu 1 (workman) porter: Lu-gamu. 21) 1 ug3 e2-a-lu-bi 1 (workman) porter: Ea-lubi. 22) 1 ug3 ˹he2˺-gi-na 1 (workman) porter: Hegina. 25) ama lugal?-gu4-e “mother” of Lugal-gue (?). 27) 1/2 šeš-kal-la 1/2 (workman): Šeškala. 28) 1/2 mu-zu-da 1/2 (workman): Muzuda. 31) gab2-us2 nig2-du7-pa-e3 herding apprentice of Nigdu-pa'e. 32) 1/2 ur-dšul-pa--e3 1/2 (workman): Ur-Šulpa'e. 1) 1/2 lu2-ma2-gan-na 1/2 (workman): Lu-Magana. 2) 1/2 ur-e2-mah 1/2 (workman): Ur-emah. 3) 1/2 du11-ga-dšara2 1/2 (workman): Duga-Šara. 5) libir-am3 they are of the previous (workforce). 6) 1/2 lu2-uš-gi-na 1/2 (workman): Lu-uš-gina. 9) im!-e tag4-a-ta remainder from the previous year (?). 11) ki lu2-dingir-ra ugula-ta from the foreman Lu-dingira. 12) 1/2 ur-den-lil2-la2 tir 1/2 (workman): Ur-Enlila, forester. 14) ki IR11 ugula-˹ta˺ from the foreman IR. 18) iti ddumu-zi-še3 until the month “Dumuzi” (12th month). 21) ˹iti*˺ d˹dumu*˺-zi-še3 until the month “Dumuzi” (12th month). 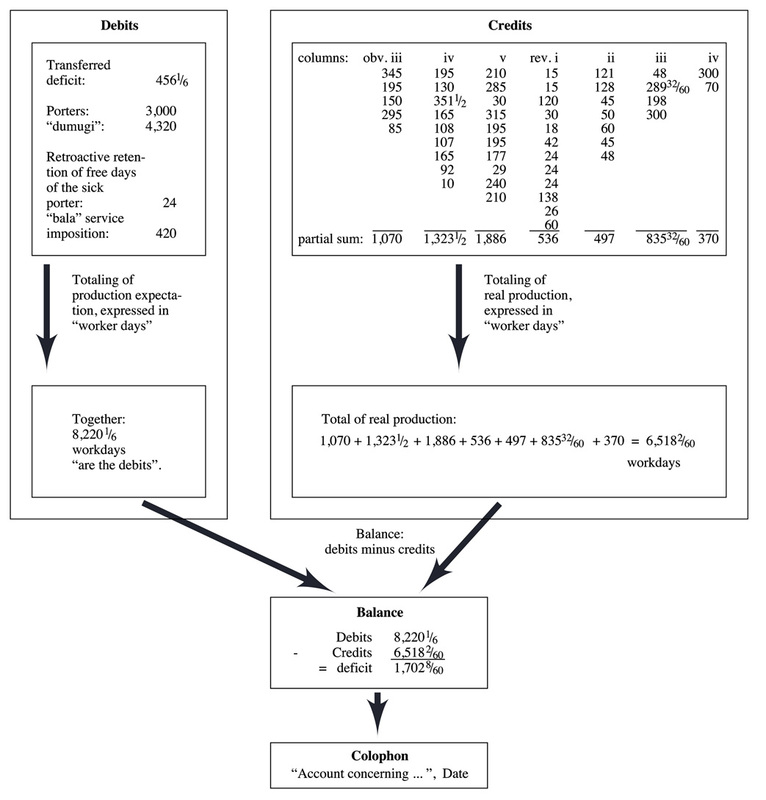 23) a2 ug3-ga6-bi u4 50.00 The corresponding production of the porters: 50.00 (3,000) days. 24) a2 dumu-gi7 -bi u4 1.12!.00* The corresponding production of “dumugi”: 1.12.00 (4,320) days. 26) a2 u4 du8-a ˹ug3˺-ga6 sag-ba zi-ga the production of free days of (the sick) porter already booked out of the debits. 28) a2 dumu-gi7 šeš-tab-ba bala-a gub-˹ba˺ the production of “dumugi apprentices” in bala service. 4) sag-nig2-gur11-ra-kam are the debits. 7) ŠE.KIN-a zar3-tab-ba a-ša3 a-u2-da-gu-la a-ša3 a-u2-da-tur u3 a-ša3 ensi2-ka harvested and sheaves piled up in the Audagula field, in the Audatur field and in the Governor field. 9) ŠE.KIN-a zar3-tab-ba a-ša3 nun-na a-ša3 nam-ha-ni u3 a-ša3 išib-e-ne harvested and sheaves piled up in the Prince field, in the Namhani field and in the Incantation priests field. 11) ŠE.KIN-a zar3-tab-ba a-ša3 gu4-suhub2 a-ša3 bad3-du3-a [a]-ša3 u2-du-dnin-a-ra-li u3 gaba a-ša3 gibil harvested and sheaves piled up in the Oxen boot field, in the field Constructed wall, in the field Cattle herder of Nin-Arali and (in the field) across from the new field. 13) a*-da gub-ba a-ša3 dšara2-˹he2*˺-gal2 a-ša3 APIN-ba-zi ˹u3*˺ a-ša3 a-u2-da-gu-la irrigation work in the field Šara is abundance, in the field Plough of Bazi and in the Audagula field. 15) ˹kab2*-ku5* a*˺-ša3 nun-na-ta sahar zi-˹*ga *a-*ša3˺-ge a du11-ga a-ša3 nun-na u3 a-ša3 ˹nam˺-ha-ni water installation in the Prince field, earth excavated, irrigation in the Prince field and in the Namhani field. 16) kišib da-a-ga Sealed tablet of Da'aga. 2) E.KIN-a zar3-tab-ba a-ša3 igi-e2-mah-še3 u3 a-ša3 dnin-ur4-ra harvested and sheaves piled up in the field Before Emah and in the field Ninura. 4) a-da gub-ba a-ša3 igi-e2-mah-še3 u3 a-ša3 dnin-ur4-ra irrigation work in the field Before Emah and in the field Ninura. 5) kišib a-kal-la Sealed tablet of Akala. 7) ŠE.KIN-a zar3-tab-ba a-ša3 GAN2-mah a-ša3 nin10-nu-du3 u3 a-ša3 APIN-ba-zi harvested and sheaves piled up in the field GANmah, in the field Ninnudu and in the field Plough of Bazi. 9) kab2-ku5 GAN2-mah-ta sahar zi-ga u3 u2 na-ga-ab-tum-ma ga2!-ra from the water installation of GANmah earth excavated and green plants placed in the pen. 11) kab2-ku5 gu4-suhub2-ka ka e2-DUN-da(?) si-ga the water installation of the Oxen boot (field) at the intake of the EDUN (canal) filled in. 13) kab2-ku5 a-ša3 nun-na-ta sahar zi-ga from the water installation of the Prince field earth excavated. 15) a-da gub-ba a-ša3 APIN-ba-zi irrigation work in the field Plough of Bazi. 17) u3-lugal ki-sur-ra-ka gub-ba stationed at the King's bridge (?) of Kisurra. 19) ˹10˺ guruš u4 1-še3 kuša-ga2-la2 ˹keš2˺-ra2 ma2-da-ga ma2-a gar [a]-˹pi4˺-sal4ki -ta ka gir13-giz-še3 ˹ma2˺ gid2-da u3 ma2 gur-ra 10 workdays, agala leather bags bound, in Madaga loaded into a barge, from Apisal to the fork from Girgiz punted and the barge returned. 20) 22.03 1/2 (partial sum:) 22.03 (1,323) 1/2. 1) kišib lu2-gi-na Sealed tablet of Lu-gina. 4) ka i7-da puzur4-ma-ma-še3 u2HAR.AN ga6-ga2 to the fork of the canal Puzur-Mama HARAN plants carried. 5) kišib ša3-ku3-ge Sealed tablet of Ša-kuge. 8) 30 guruš u4 1-še3 gi na-ga-ab-tum u3-dag-ga-da tuš-a 30 workdays, staying at the “reed nagabtum-pen” with the Daga bridge. 9) kišib lu2-dšara2 dumu uru-bar-re Sealed tablet of Lu-Šara, son of Uru-bare. 11) kun-zi-da e2-dlamma-ka gub-ba at the reservoir of the Lamma temple in service. 12) kišib lugal-inim-gi-na Sealed tablet of Lugal-inim-gina. 16) kab2-ku5 a-u2-da-tur ku5-ra2 u3 šu2-luh-ak water installation of the Audatur (field) cut off (?) and cleaned. 17) kišib lugal-he2-gal2 Sealed tablet of Lugal-hegal. 19) a-da gub-ba a-ša3 bad3-du3-a a-ša3 išib-e-ne u3 a-ša3 u2-du-lu2-sag10 irrigation work in the field Constructed wall, in the Incantation priests field and in the field Herders of Lusag. 20) kišib na-ba-sa6 Sealed tablet of Nabasa. 22) a-ša3-ge a du11-ga a-ša3 dšara2-gu2-gal field irrigation work performed in the field Šara-gugal. 23) kišib 2 a-gu-gu Two sealed tablets of Agugu. 25) mar-sa-a gub-ba ugu2 ur-e11-e ba-a-gar stationed in the boathouse, booked into the debits section of Ur-e'e('s account). 26) kišib ur-dnun-gal Sealed tablet of Ur-Nungal. 30) a2-bi u4 4.00-kam the corresponding production: 4.00 (240) days. 31) kišib ur-e11-e Sealed tablet of Ur-e'e. 34) ma2-da-ga-aš gen-na having gone to Madga. 35) kišib lugal-iti-da Sealed tablet of Lugal-itida. 2) e2 bahar3-a gub-ba stationed in the pottery factory. 3) kišib inim-dšara2 Sealed tablet of Inim-Šara. 5) guru7 GAN2-mah im ur3-ra silo of GANmah plastered with clay. 6) kišib gu-du-du Sealed tablet of Gududu. 8) ki-su7 nin10-nu-du3-a-ta a-pi4-sal4ki -še3 in-u im-la2 from the threshing floor of the (field) Ninnudu to Apisal straw hung out. 10) ga2-nun du6-ku3-ge-ta guru7 a-pi4-sal4ki-še3 gi ma2-a ga2-ra ma2 gid2-da u3 ma2 ba-al-la reed loaded into the barge, barge from the Dukuge storage house to the silo of Apisal punted and barge unloaded. 11) kišib 2 lu2-du10-ga Two sealed tablets of Lu-duga. 13) kun-zi-da e2-dlamma-ka-še3 nig2 gu2-na bala-a ga6-ga2 transport of the bala load to the reservoir of the Lamma temple. 15) a-pi4-sal4ki-ta nibruki-še3 ma2 nig2-ar3-ra u3 še mu-ša gid2-da from Apisal to Nippur barge with rough ground flour and muša grain punted. 16) kišib šeš-sag10 Sealed tablet of Šeš-sag. 18) ki-su7 dšara2-gu2-gal-ka še bala-a from the threshing floor of Šara-gugal barley transferred. 20) e2-amar-ra dabin bala-a še ma2-a si-ga in E-amara flour transferred, barley loaded in the barge. 22) a-pi4-sal4ki-še3 ma2 še gid2-da ma2 ba-al-la u3 še bala-a barge with barley to Apisal punted, barge unloaded and barley transferred. 24) ki-su7 nin10-nu-du3-a-ta e2-duru5-a-bu3-ka-še3 še zi-ga from the threshing floor of Ninnudu for the Abu village barley winnowed. 26) kun-zi-da a-gi-ze2-a-ka gub-ba stationed at the reservoir of Agizea. 28) kun-zi-da e2-dlamma-ka-še3 zi3 ga6-ga2 to the Lamma temple reservoir flour carried . 29) 8.56 (partial sum:) 8.56 (536). 2) a-pi4-sal4ki-ta nibruki-še3 ma2 zi3-da gid2-da [zi3] bala-a u3 ma2 su3 a-pi4-sal4ki-še3 gur-ra from the Apisal to Nippur barge with flour punted, flour transferred and empty barge returned to Apisal. 4) ummaki-še3 gu4 niga-da gen-na walked with fattening oxen to Umma. 5) giri3 lu2-dsuen gurušda Responsible: Lu-Suen, the fattener. 8) a-ra2 1-kam first time. 13) a-ra2 2-kam second time. 16) a-ra2 3-kam third time. 17) giri3 a-kal-la ra-gaba Responsible: Akala, the “ragaba”. 19) a-pi4-sal4ki-ta nibruki-še3 ma2 i3 ga ku6 šar gid2-da u3 ma2 gur-ra from Apisal to Nippur barge with oil, cheese, fish and vegetables punted and barge returned. 20) giri3 tur-am3-i3-li2 Responsible: Tūram-ilī. 22) a-pi4-sal4ki-ta nibruki-še3 ma2 ku6 gid2-da u3 ma2 gur-ra from Apisal to Nippur barge with fish punted and barge returned. 23) giri3 nig2-lagar-e Responsible: Nig-lagare. 24) 8.17 (partial sum:) 8.17 (497). 3) ki-su7 a-u2-da še bala-a še zi-ga u3 guru7 a-pi4-sal4ki im ur3-ra at the threshing floor of Auda (field) barley transferred, barley winnowed, and silo of Apisal plastered with clay. 7) ugu2 ur-e11-e-ka ba-a-gar booked into the debit account of Ur-e'e. 9) gi zi ša3-gal udu niga sa2-du11 dšara2-ka ze2-a a-ša3 dna-ra-am-dsuen e2 udu a-pi4-sal4ki-še3 ga6-ga2 good reed, fodder for the fattening sheep, the regular offerings of Šara, torn out in the field of Narām-Sin, to the sheep fold in Apisal carried. 11) kišib lu2-dha-ia3 Sealed tablet of Lu-Haja. 13) ki-su7 nin10-nu-du3-a-ta e2-amar-ra-še3 in-u ga6-ga2 from the threshing floor of Ninnudu to E-amara straw carried. 14) kišib a-tu šuš3 Sealed tablet of Atu, chief cattle administrator. 16) 13.55 1/2 2 gin2 (partial sum:) 13.55 1/2 2 shekels (835 32/60). 3) a2 u4 du8-a ˹ug3-ga6˺ production of free days of the porters. 5) a2-bi u4 1.10! the corresponding production is 1.10 (70) days. 6) bala-a gub-ba ˹bala-še3˺ gen-na u3 bala-[ta] gur-ra stationed in the bala, gone to bala, returned from the bala. 8) 6.10 (partial sum:) 6.10 (370). 3) [la2-ia3] ˹28.22 8˺ [gin2 u4 1-še3] [deficit:] 28.22 8 shekels (1,702 8/60) [workdays]. 5) nig2-ka9-ak a2 erin2-na-ka Account of the production of the erin workers. 6) lu2-dšara2 ugula dumu lugal-inim-gi-na Lu-Šara is the foreman, son of Lugal-inim-gina. 10) mu ma2 den-ki ba-ab-du8 Year: “the boat of Enki was caulked”.